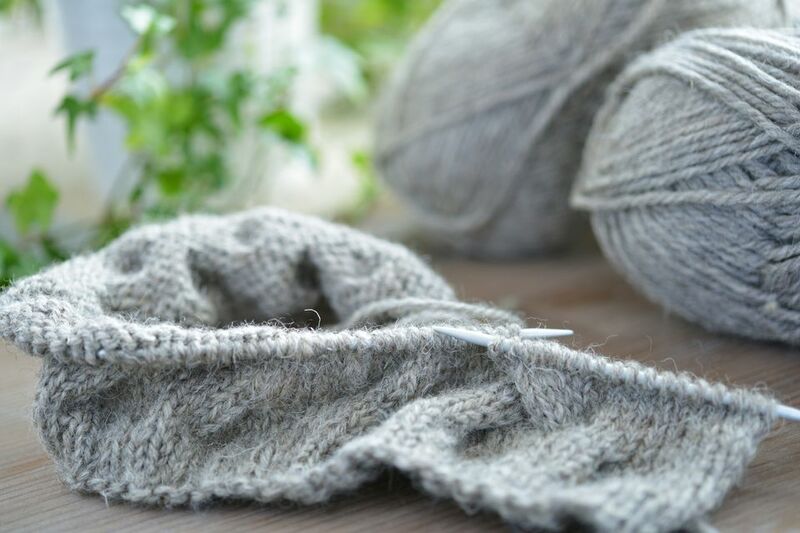 While a bind off stitch is simple, it doesn't always produce the cleanest or neatest of edges. If you're looking to add some flair or just want a neater finishing touch to your project, the I-cord bind off is perfect. It creates a tube similar to an I-cord which is where the name comes from. To begin your I-cord bind off, knit your piece as described in the pattern. The bind off can be worked on either the front or back side, but this instructional shows it on the front for ease of illustration. Before beginning the bind off, cast on three more stitches at the beginning of the row, with all the stitches on the left-hand needle. An easy way to do this is with the cable cast on. You can cast on more than three stitches if you like to make a wider cord, or fewer to make a narrower cord it all depends on the look you're going for. Now that your cast on stitches are in place, knit the first two stitches and do a slip, slip, knit. This means you will have decreased one stitch and you'll have three stitches on your ​right-hand needle. If you cast on a different number of stitches, knit all but one of the stitches you cast on before performing the decrease. In order to continue working the I-cord bind off (also known as applied I-cord) you have to slip the stitches you just worked back from the right-hand needle to the left-hand needle. These stitches should be slipped as if to purl. To continue, perform the knit 2, slip, slip, knit again. Continue to repeat the previous step until you are down to as many stitches as you cast on at the beginning of the bind off (in the case of this example, that's 3). Slip the stitches back to the left-hand needle one more time and knit them all together. Break your yarn and pull it through the remaining loop. If you have an even number of stitches left, you can also graft the tube closed, which will allow it to keep a slightly more rounded shape on the end. This method of binding off is very time (and yarn) consuming, but it also makes a great finishing touch for a pocket, collar, button band or anywhere else you like. This bind off can get pretty tight, causing the work to pucker. If you're having trouble, use a needle a size or two larger than the one you worked your project with in your right hand to keep the stitches loose. You should also try to leave yourself some extra room when you're knitting. Remember, however, that you are knitting an I-cord, so the first stitch of each row needs to be pulled tight enough to keep the tube closed on the back side.